Hurry! 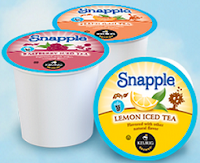 If you've not had a chance to score the FREE Snapple Brew Over Ice K-Cup Sample Pack from Target, its still available. Just click "Request Sample", answer some questions and fill out the form!